This modular system can be tailored to all rotary and flexo presses with a scaleable width of 90 to 540mm. The system can be retrofitted by IST (UK) engineers speedily and easily. The packaging includes cables, power supply, control and chiller, full light shielding and interlocking for total safety compliance. “There is growing interest in LED in both the litho and narrow web markets and we anticipate taking a number of enquiries about the technology and its advantages,” said Simon Mitchell, joint managing director alongside Chris Schofield. 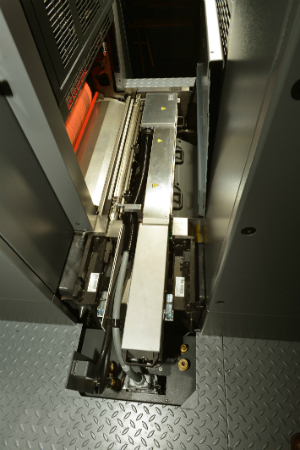 IST (UK) will also demonstrate its Hot Swap system which allows printers (litho and narrow web) to adopt and run UV and LED concurrently with transferrable cartridges which use the same housing and energy source. It is a great stepping stone into LED without risk. Schofield said: “The UK is behind the rest of Europe in its take up of LED but there is growing interest. Development in equipment and inks is rapid and this is likely to be a hot topic at Drupa so getting a preview at Label & Print will be a great opportunity for printers. IST (UK) is based in in a 400m² facility in Skipton which includes training and presentation areas, systems and spares storage as well as being the main base for the sales and service team.